The second lake overturn within a week at an Italian volcanic lake was recorded last weekend (14-15 January 2017). After fish kill was observed a week earlier at Lago Averno, located in the northern sector of the restless Campi Flegrei Caldera, north of Naples, Campania, the Monticchio Piccolo lake of Vulture volcano, Basilicata, Southern Italy, turned red, while its larger, but slightly shallower (35 vs 38 m depth) neighbour Monticchio Grande maintained its usual dark blue color. Monticchio Piccolo turned red, not-coincidently contrasting with the white snow (Pictures by Diego Sabbatini). Despite the ongoing unrest at Campi Flegrei, also recently highlighted in the Italian and international press, Giovanni Chiodini (INGV-Bologna, Italy) explained (in a divulgation post on his Facebook page) that the fish kill at Lago Averno was caused by lake overturn due to mixing of anoxic deep water layers with O2-rich shallow water layers… no changes in volcanic activity beneath Lago Averno are needed -nor happened- to cause this at-first-eye worrying event. Lago Averno, Campi Flegrei, Naples, during “fish-kill quiescence” (Picture by Mauro Di Vito). Similar fish kill events occured at Lago Averno in 2002, 2003 and 2005… always during the winter period! The graph below, from Caliro et al. (2008, JVGR), explains that lake overturn, and consequently fish kill, is density driven: water density is highest at 4°C, a temperature reached for surface water only during cold winters in southern Italy. As such, the cold and dense surface waters push down into the warmer and less dense deeper waters, leading to lake overturn. Southern Italy is currently passing through and exceptionally cold winter, with near-freezing temperatures and snowfall, even at low elevations. The Monticchio Grande and Monticchio Piccolo lakes were formed after the 140,000 a B.P. maar-forming eruptions, the last magmatic events of the rather poorly known Vulture complex stratovolcano (1,270 m a.s.l. ), in Basilicata. Lake overturn at the Monticchio lakes, as paroxysms or more gentle events, has been documented in historical reports for the past 200+ years. Some have caused fish kill, as last week at Lago Averno. Caracausi et al. (2009, Terra Nova) discuss some triggering mechanisms of these overturn events at Vulture, besides providing the dissolved gas contents along the vertical profile of the maar lakes. A red-colored Monticchio Piccolo at Vulture volcano, Basilicata (January 2017, picture by Diego Sabbatini). 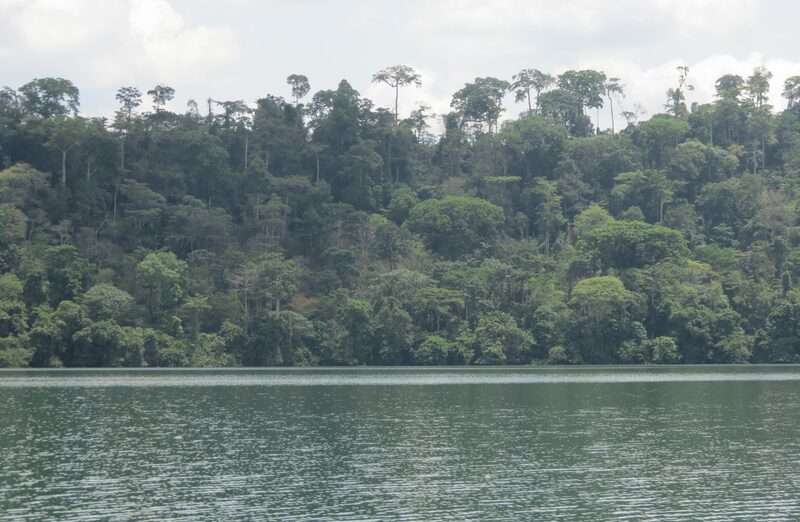 The red color of the surface waters is almost surely caused by the oxidation of iron from bottom waters transported to the surface during lake roll-over… a yet classical mechanism, adopted from the “big brothers” Lake Nyos and Lake Monoun, Cameroon. Although unfortunate for the fish, the two 2017 lake roll-over events at Lago Averno and Monticchio Piccolo are more comforting than worrying, in terms of volcanic risk assessment: periodical turnover during winter times of lakes in temperate regions is paired with the gentle release of gas (CO2 and CH4) stored in the bottom waters (Cabassi et al. 2013, Bull Volcanol), avoiding gas pressure build-up to supersaturation levels in deep water layers, possibly leading into more explosive gas releases. Nevertheless, both Lago Averno and Monticchio Piccolo (and Grande) are a lot smaller and less deep than Lakes Nyos and Monoun (Cameroon, 1986 and 1984 lethal gas bursts), and hence cannot store large amounts of gas to eventually convert them into Italian “killer lakes”. Further research might be needed (CTD depth profiles, chemical and isotopic composition) to detail these particular events; operations that will probably support the above hypothesis based on simple surface observations and scientific experience. Regarding volcanic risk reduction, let’s say that re-zeroing the “CO2-CH4 clock” at these shallow lakes is rather “good” than “bad”. With the striking of these winter lake roll-overs in southern Italy, a major concern now is to see if, and if so how, Lago Albano will “flip over ” this winter. Earlier research has demonstrated that Lago Albano, a large, 167 m deep crater lake of the active Colli Albani volcano (south of Rome) partially releases its CO2 each winter (Chiodini et al. 2010, Bull Volcanol), after being recharged with CO2 during a seismic swarm in the late 1980s. Since the recent major tectonic earthquakes in Central Italy (August-October 2016) a depth survey has not yet been elaborated at Lago Albano. Giovanni Chiodini and Dmitri Rouwet (INGV-Bologna) during the May 2010 Lago Albano survey.